Stunning Doubtful Sound in the heart of Fiordland National Park. Beautiful Lake Rotorua. Stunning scenery in ‘Adventure capital’ Queenstown. Visit Rainbow Springs Nature Park. Historic goldrush Arrowtown. Visit Te Papa, the Museum of New Zealand. Experience Māori culture at the Tamaki Māori Village. Zealandia, the world’s first fully-fenced urban ecosanctuary. 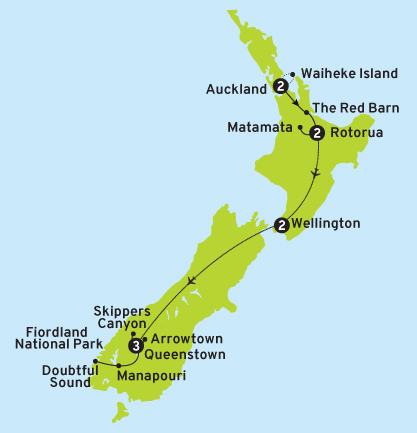 9 night Inspiring New Zealand tour including accommodation, luxury coach, airport transfers, daily breakfast, 3 lunches & 6 dinners. Doubtful Sound in the heart of Fiordland National Park. Stunning scenery in ‘Adventure capital’ Queenstown. Visit Rainbow Springs Nature Park. Visit Te Papa, the Museum of NZ. Experience Māori culture at the Tamaki Māori Village.